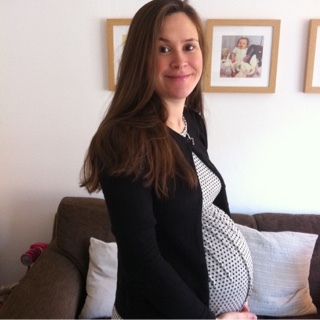 This is the second part of my pregnancy, labour and birth 'diary' post series. If you missed it you can read part one here. I can't remember exactly when we decided that we would add to our family but I know that I had always hoped to have a least one sibling for Ellie and that I wanted them fairly close together if possible. It was probably around the time she started sleeping a bit better as before then I couldn't have possibly contemplated it, although hormones are funny things. I found out I was expecting Phoebe when Ellie was 18 months old. We had been to Norfolk for three days with my family for a special celebration. I totally missed all the signs as to be honest I had been hoping to fall pregnant for about 9 months and had convinced myself yet again that I was every single month until then. We were so busy this particular weekend with beach trips, farm visits, lunch trips, dinners etc that it wasn't on my mind at all. On the Saturday night I poured myself a glass of wine at dinner and nearly spat it out after taking a sip, for anyone who knows me I would not do this lightly but it tasted disgusting! I remarked that I thought the wine was off at which point my whole family took a sip from their glass and said they didn't know what I was on about. The next day after getting home and unpacking I popped to the supermarket to get a few bits, I don't know what made me do it but I walked past the pregnancy tests and picked one up. I went upstairs and took the test just as my husband was coming up the stairs. I hid it under the bath mat as we had recently had a discussion about only taking a test if I was a week late (it can get quite costly after a while this stick peeing thing!) he asked me what I was doing and I said 'nothing' before popping back into the bathroom and sneaking a look at my secret pregnancy test to see two very strong lines... This was going to be awkward... I went into our bedroom with the test in my hand and sheepishly told him what I had been doing in the bathroom. I spent the next 16 weeks throwing up 3-5 times a day again and feeling pretty dreadful to be honest. It's a different ball game second time round when you have a busy toddler to look after and I'd completely forgotten how tiring that first trimester, in fact scrap that.. all of it is. Ellie and I watched far too much Peppa Pig and I napped and went to bed when she did. I knew from experience that it would get better and I would hopefully stop being sick soon. We decided the day of our 20 week scan that we'd quite like to know whether the baby was a boy or a girl this time, but Oli really loved announcing our news when Ellie arrived so we decided we wouldn't tell anyone, not even Ellie that we knew. 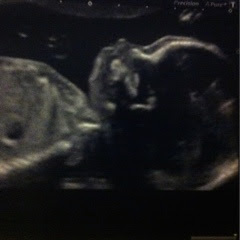 Friends and family had asked us before the scan if we were going to find out what we were having and we had said no, so nobody asked us really so it was easy to keep a surprise although quite funny when people told us we were 'definitely having a boy'. The preparations for Phoebe's arrival included the usual washing of baby grows and hospital bag packing (although this time there was much less in it having used barely any of what I took in last time) and preparing Ellie to have a sibling. This involved lots of story books about new babies, multiple re runs on the Peppa pig episode where Miss rabbit has babies and moving her out of the nursery into her 'big girls room'. 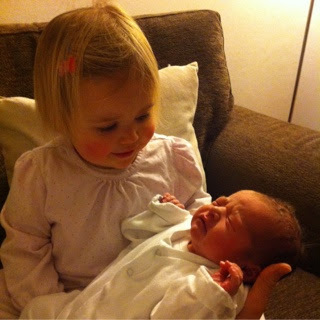 I felt apprehensive about how she was going to feel, whether I would be able to love another baby as much as I loved her and nervous about making plans for her care when I went into labour. I kept reassuring myself that we were giving her a great gift and both being from a close family of 4 children my husband and I knew this would absolutely be true. I bought Phoebe two newborn pink sleep suits of her own to take to hospital, although we had tonnes of newborn girls things I wanted her to have a couple of things that were hers first, although practically the hand me downs were so handy as they are in them in no time at all and they had only been worn a couple of times if that. 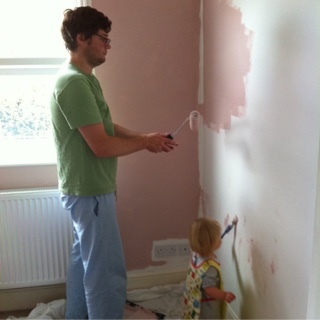 With a 2 year old at home there was no maternity leave as I knew it last time, however the pregnancy went much quicker than my first and because I sort of knew what to expect I felt more relaxed about it all. Miss Tibs was due mid January which meant I didn't have much room left in my tummy for all the lovely Christmas food that year. I had also convinced myself that because Ellie had been 4 days early that this baby would be early too which meant I banned Oli from drinking over the festive period just in case. 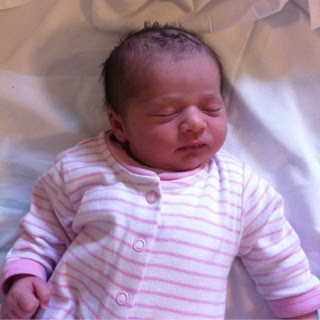 As it turned out, Phoebe wasn't early, she actually arrived 4 days past her due date. I didn't get to my due date with Ellie and it's a funny old feeling when it rolls round. Towards the end of pregnancy people often ask you when you are due, the state of panic on the lady's face at the supermarket check out when she asked and I replied "today actually" was priceless. I pretty much went to bed every night from 37 weeks wondering if the baby would make an appearance and what her birthday would be. Nine months goes so quickly yet a few days can feel like an eternity. I felt really calm despite being a little bit impatient this time because I knew what to expect, I knew what a contraction felt like, when it was the real thing and not Braxton hicks, when to go to hospital and ultimately that I could do it and it was all so, so worth it. The day I went into labour was a wet, rainy January day, after an afternoon nap we walked down to the park around the corner from us to take Ellie puddle jumping. I felt quite achey and was beginning to niggle. We went to my parents for Sunday dinner, I knew I was in early labour but didn't say anything there were a lot of us there and the noise from the chitter chatter made me quite irritable and I found myself having to leave the room every now and then. The contractions were sporadic with no real pattern to them but by 8pm we were home and I was bouncing on my ball knowing that we would soon be meeting our new daughter. After organising for my mum to come and stay with Ellie we headed to hospital about 2am. The contractions felt strong, like they were when I was well on my way with Ellie. When we got to hospital I was actually only 3cm dilated but 'could be stretched to 7cm' whatever that means?! Probably too much information but never mind. I was tired and my contractions had gone from every 5-10 minutes back to every 15-30 minutes. Our midwife was amazing and could see that I just needed to relax. She sent me to the antenatal ward at 5am to get some rest and was pretty convinced that as soon I got some things would be back up and running pretty quickly. Oli wasn't allowed to come with me so he went to the car for a quick power nap. Now, it was a very cold January night and if you ask him about Phoebe's' birth he will tell you that his eyeballs froze while he attempted to sleep in the car... Poor him... Meanwhile I was on the ward having very intense contractions again, by 7:30am I really needed some gas and air and rang the bell to see the midwife. I had reached 8cm and was promptly put in a wheelchair and wheeled down the corridor back to delivery where we just happened to meet my chilly husband and his frozen eyeballs. As the birthing pool was filling up I finally got some gas and air before climbing in at 8am. The relief was immense, it felt familiar, I knew what I was doing and felt so calm all of a sudden and of course the gas and air helped a lot. My waters went at 8:15, and after just 3 pushes Phoebe entered the world rather speedily at 8:27am. All my worries about whether I could possibly love another baby immediately disappeared, she was beautiful. I expected the placenta delivery and stitches this time and I think they were marginally worse for my husband who was sat in a chair snuggling our new baby at the opposite end of the room directly facing me... You get the picture. After tea, toast, shower and checks we made our way home in time to introduce Phoebe to her big sister before her bedtime. We put a present in the bottom of the pram top which Phoebe was in for Ellie. When she got home she ran to see the baby and was so happy to have a little sister. She saw the present and said 'oh look there's a present for her, can I help her?' She couldn't believe it when we told her it was actually for her. It felt lovely, the four of us together in our living room and just like it had always been that way. I didn't have to divide my love between my babies, there was just more of it.